Plantation Farm is a modern training establishment, owned by Kate and Richard Bandey. Richard was granted a Combined Trainer License by the British Horseracing Authority in September 2018 allowing him to train National Hunt and Flat racehorses. Richard has been training point-to-pointers here since 2011 and Kate will now take over training the point-to-pointers. Richard is very hands-on in the horse’s day-to-day management; he is the first to feed in the morning, rides out every day and is the last to leave at night. Kate is an equine vet and she also rides out every morning. They are backed up by knowledgeable staff who have many years experience working with horses. Time is spent to get to know every horse in our care and to give them the individual attention that they deserve. 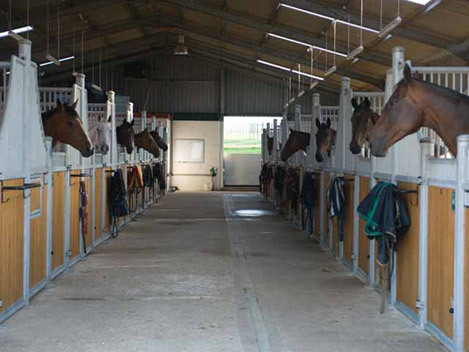 Our racing stable barn has been designed with the horse’s best welfare and comfort in mind. Horses are naturally sociable animals and our stables have open grid partitions and low open fronts, allowing them to socialise with each other as they would do in a herd environment. We have installed a mechanical ventilation system to ensure that we maintain excellent airflow throughout the barn at all times, significantly reducing the risk of airway infections. With 2,500 acres of farmland to ride around and access to three all-weather gallops; there are plenty of opportunities to improve the fitness of the horses in our care. Our horses are trained without the stress and repetition of working on the same gallop and time is spent educating the horses to work in an outline. Our horses are turned out in the paddock most days. This keeps them fresh and happy, which is ideal for horses that need a change of scenery or ‘freshening-up’ from the regime of a big training yard. Having an on-site vet gives owners the reassurance that horses in our care are in the best possible hands. Should any injury or illness arise you can rest assured that your horse will receive prompt veterinary attention without any expensive call out fees! Richard and Kate set up the Plantation Picnic Club racing syndicate in 2012 and they have enjoyed much success. They have since set up another racing partnership in 2017 called the Plantation Prosecco Partnership. 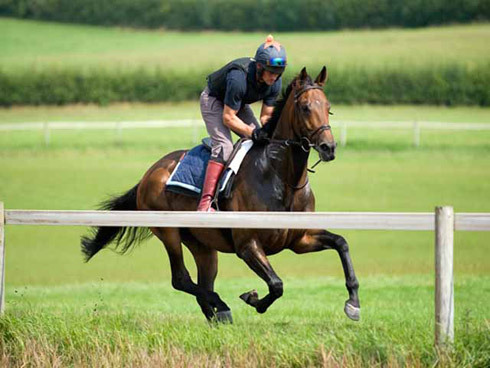 If you are interested in joining our syndicate, would like to send Richard or Kate your horse to train or would like our assistance in purchasing a racehorses on your behalf; please give us a ring to discuss your requirements.